Helped by clear weather, search teams began the grim task of retrieving the bodies of the more than 100 people killed when their Iranian airliner crashed into a snow-covered mountain. An army helicopter carrying five or six bodies in a metal box hanging from a rope landed at Lorestan army base on Thursday. Many of the bodies were dismembered or mutilated. The helicopter made two trips before darkness set in, each time being greeted on arrival by wailing relatives who beat their heads in grief. Some were allowed inside the base to identify the victims. "I couldn't identify anyone. All the bodies are disfigured beyond recognition," said an emotional Masoud Hashemi, whose brother, sister-in-law and their child were among the passengers. Up to 12 bodies were brought to the base from the crash site. The official Islamic Republic News Agency revised the number of people aboard the Russian-made Tu-154 airliner that crashed Tuesday to 107 passengers and 12 crew. Earlier reports had put the number of people to 117. All were presumed dead. As the weather cleared for the first time since the plane crashed early Tuesday outside Khorramabad, about 230 miles southwest of the Iranian capital of Tehran, a few helicopters took off for the foggy reaches of the Sefid Kouh mountain where dozens of bodies have been spotted in the snow. At a makeshift base at the foot of the mountain, trucks rolled in with dozens of coffins to transport the victim's remains. Col. Heydar Paknejad, one of the helicopter pilots, cautioned that strong winds would make more flights impossible, IRNA quoted him as saying. Rescue teams have tried to reach the site several times by air, only to be forced to return by bad weather. Climbers trying to reach the site suffered broken bones. The plane lost contact with the Khorramabad airport control tower minutes before crashing into the Sefid Kouh mountains, or white mountains in Persian. The cause of the crash of Flight 956 was not known, but officials said the aircraft went down in bad weather. At least 10 government officials were onboard, said Behrouz Goudarzy, deputy governor general of Lorestan province where the mountains are located. Subject to U.S. sanctions, Iran has difficulty buying western aircraft or obtaining spare parts for its aging fleet of Boeing planes, acquired mostly before the 1979 Islamic revolution. Iranian airlines have instead turned to Russia and Ukraine for cheaper planes. The crash, the latest in a string of air disasters over the past four years involving Russian-built airliners, has caused an uproar in Tehran. "The United States shares the responsibility for the dying of so many innocent people because it is refusing to sell Boeing planes and spare parts to Iran," said Ahmad Pirayesh, a close friend of one of the plane victims. "If we had Boeing planes this crash would not have happened," Pirayesh said. "In Kuwait, an oil well catches fire and four people are burnt tdeath and the oil minister resigns after taking responsibility. ... Why is it that in Iran nobody feels responsible for plane crashes?" IRNA quoted one unnamed MP as saying. Before incorporating the Russian-made planes into its fleets of nearly exclusively Boeing airliners, Iran had one of the cleanest air safety records in the world. Army pilot Latif Derikvand said that mechanical fault was the likely cause of the crash. "When the weather is bad and the pilot does not have proper vision, he relies almost exclusively on electronic instruments for navigation and landing," said Derikvand, at the crash site to help an investigation. "Even a slight fault in the instruments can cause a disaster," said Derikvand. In Moscow, Tupolev chief designer Aleksandr Shingart told Ekho Moskvy radio on Tuesday that the plane received a "proper" routine service in January. Iranian President Mohammad Khatami has ordered an emergency committee to investigate the crash. 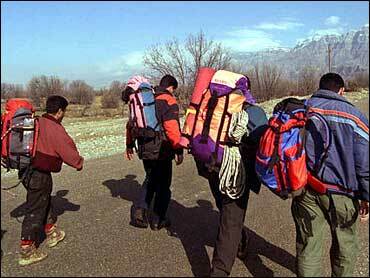 Transportation Ministry experts have been dispatched to Khorramabad. The head of Iran's Civil Aviation Organization denied reports Thursday that he had resigned after the crash. "My tenure ended about a week ago and I asked the transport minister if I am still in the job. I am still waiting for an answer. This does not mean I have resigned," Behzad Mazaheri said, quoted by IRNA. IRNA said earlier Mazaheri had resigned in the face of public anger over the crash. Many parliamentarians have called on Transport Minister Ahmad Khorram to step down. Khorram's predecessor died in a plane crash last May. The latest crash has led to calls for an end to the use of Russian aircraft by civilian airlines. Khorram told IRNA all Tupolev planes would gradually be removed from the Iranian fleet and that $1 billion had been set aside to purchase more advanced aircraft. He said the country's airports would also be further equipped to prevent more air disasters. But Mazaheri said his country was better off using Tupolev planes, at least in the short run. "The Tupolev planes are more equipped and advanced than the western aircraft in our fleet. They have stronger engines and are easier to maintain," he said. "When it becomes evident that the plane crashed for technical reasons then we can discuss replacing them."